‘Spot the Green Beret’ is an easy chore at Firebase Cobra, a remote American outpost in Oruzgan province, central Afghanistan. 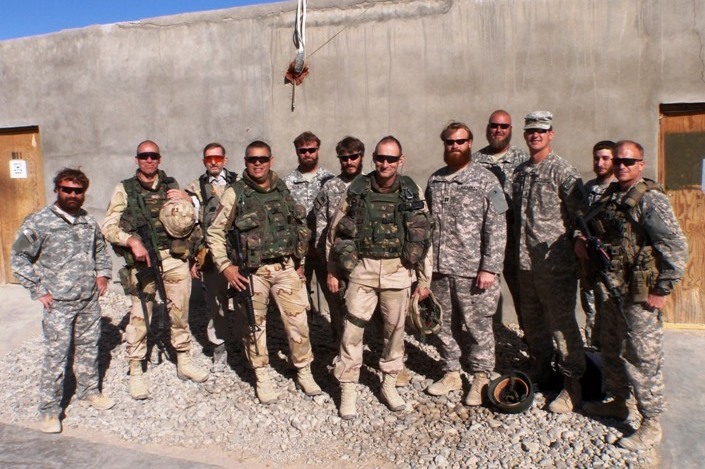 The U.S. Army Special Forces (Airborne) soldiers invariably wear beards. This in contrast to clean-shaven Dutch Major General Mart de Kruif, the outgoing commander of some 40,000 NATO troops in Southern Afghanistan and his entourage. After seven earlier (but failed) attempts, the General managed to visit Firebase Cobra earlier this week. Not that the U.S. Green Berets fall under his command at the sprawling Kandahar Airfield base. They are part of Operation Enduring Freedom (OEF), the multinational, U.S.-led counterterrorism coalition, as opposed to the NATO-led International Security Assistance Force in Afghanistan (ISAF). Still, the activities of ISAF and OEF are being coordinated (or ‘deconflicted’ in military parlance) at Headquarters level, if only to prevent units of the two operations running into each other while out on operations. 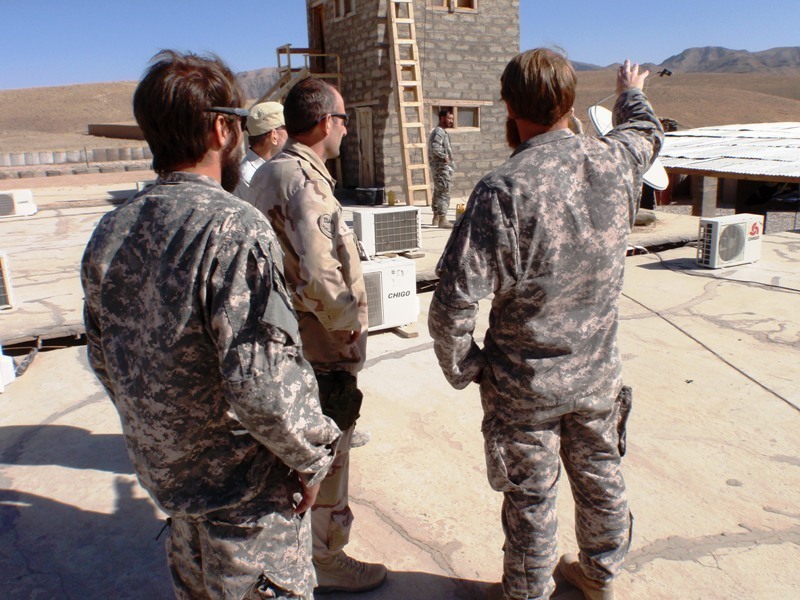 The main purpose of General de Kruif’s visit to Firebase Cobra (now known as Firebase Tinsley) is to check whether the coordination efforts at his three-star level also work out in the field. Also, during his one-year period of command, the Dutchman made a point of visiting as many of the some 160 forward operating bases of ISAF and OEF in southern Afghanistan as possible. To meet local commanders face-to face, and to see the often challenging circumstances with his own eyes. Challenging is one way to describe the environment in the district of Charchino in this northwestern part of Oruzgan province. Firebase Cobra is completely surrounded by hostile forces. Supplies have to be airdropped or flown in by helicopter. The Green Berets spend eight months here, uninterrupted by such luxuries as a brief home leave. Their number is classified, but it’s safe to say that there is more than one Operational Detachment Alpha (ODA) here, the 12-men strong basic unit of the Special Forces. Also, they have the necessary fire support at the base. Again, details are classified, but it suffices to say that this reporter saw more than one 105mm howitzer and more than one heavy mortar at Firebase Cobra. In a little over two months, the guns dispatched almost 5,000 rounds, from smoke and illuminating grenades (to protect patrols of the ODA’s), to lethal High Explosive (to hit the enemy if and when need be). This, too, is indicative of the ‘challenging’ environment Firebase Cobra finds itself in. This is Oruzgan’s ‘Wild West’. Still, as one Green Beret, on his second tour at the firebase, remarks: “last time I was here, they opened fired as soon as we left the gate. Now, this doesn’t happen until we venture out a couple of clicks (kilometers, hdv)”. Improvised Explosive Devices, or IED’s, are a growing problem, as they are on other parts of Afghanistan. In certain areas of the district, the Green Berets now prefer to patrol on foot, rather than in their armored Humvees. A blown-up Afghan police pick-up truck tucked away in the repair corner of the firebase testifies to this problem. The truck is beyond repair. 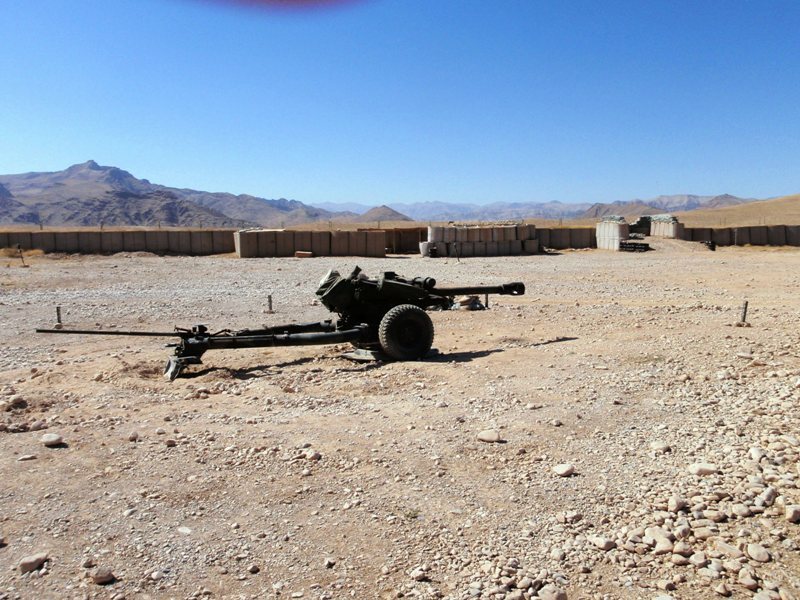 Adjacent to Firebase Cobra is a small unit (38 men) of the Afghan National Army (ANA), which operates together with the Special Forces. It’s commander told Radio Netherlands that the Taliban in Charchino district are mainly trained in Pakistan or, indeed, from Pakistan itself. It’s impossible to verify that claim, but based on experience elsewhere in Oruzgan, local feuds between (or within tribes) may play a role as well. What is certain is the local population around Firebase Cobra have come to like the Special Forces, if only for the practical assistance they can offer. Every day, for instance, some 50-60 locals report at the primitive sick bay for treatment of a variety of injuries and illnesses. The American doctor doubles as a vet to treat cattle. And in spite of the logistical challenges, the pharmacy is well-stocked. In the public realm, there’s the notion that ‘OEF’ mainly hunts down Taliban and terrorists, whereas ISAF is more into less-kinetic operations, such as reconstruction. Major General De Kruif speaks out against that perception. “They, too, are actively pursuing the ‘three D’s”, the general says, referring to Defense, Diplomacy and Development. A bit to the South, the Helmand River streams through a narrow gorge and eventually leads to the safe area around Deh Rawod, where both ISAF and OEF have a base, as do the ANA and the national police. However, the valley is hostile, the terrain is ideal for the insurgents and it would take a major operation to link the Firebase Cobra area to Deh Rawod. Still, the Dutch general predicts that in a year’s time, that link-up will be realized. Is it a heads-up for an upcoming offensive in this region? Time will tell. 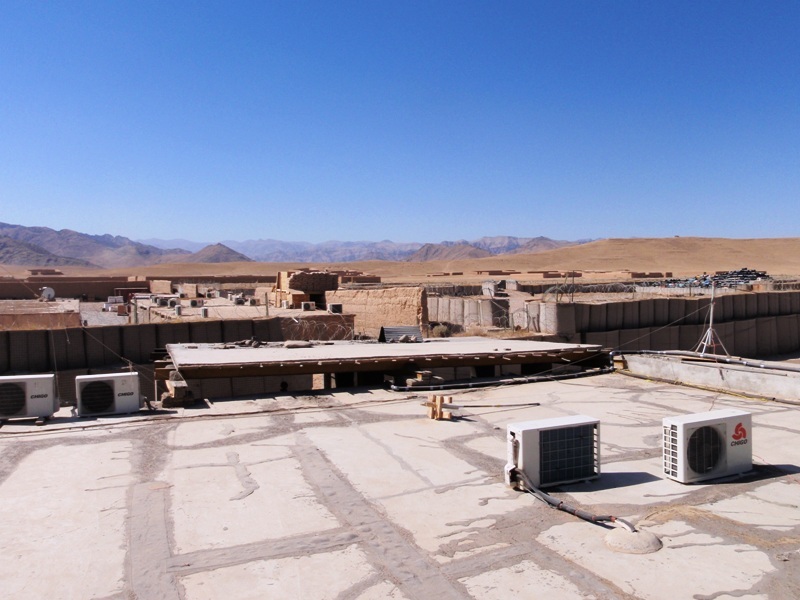 Dit bericht werd geplaatst in Afghanistan, NAVO, Uruzgan, Verenigde Staten en getagged met 7th Special Forces Group (Airborne), Charchino, ISAF, NATO, ODA, Operation Enduring Freedom, Oruzgan, Shahidi Hassas, Tinsley, Uruzgan. Maak dit favoriet permalink.